At one point, there was such a thing as separation between your work life and your social life. For many professionals, this is no longer true. This is why more and more thought leaders, business consultants, and influencers choose to build a personal brand: it’s not enough to be a nameless part of a larger, corporate brand anymore. 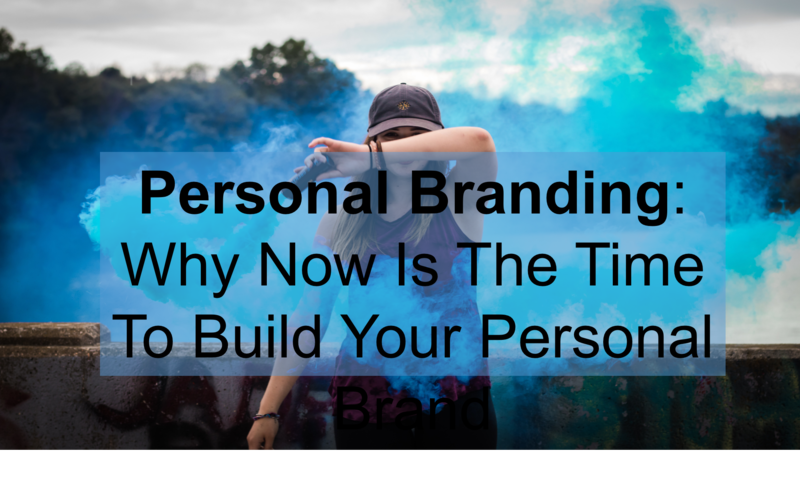 Here I’ll answer some of the most pressing questions about building a personal brand: what is personal branding, how does it benefit you as an individual, and how can you do it effectively? Business-level branding has been a key part of the economy since the Industrial Revolution. Today, children who are not yet old enough to read can recognize popular brands like McDonald’s and Nike. That said, brands used to be only for businesses. Employees were expected to uphold and support the principles of the brand. Some of us in marketing were even lucky enough to help our businesses build their brands. But as trust has eroded away from corporations and government institutions, we are seeing the ushering in of a new era: the personal brand. Those of us who understand how to yield the power of our networks will achieve greater levels of professional success. And those who know how to use social channels to deliver helpful messages will ride the wave of this new era in personal branding. Now, more than ever, is your time to shine as a positive voice in the crowded media marketplace. The rise of branding on a personal level has been more recent. For a long time, personal branding was better left to athletes, models, and Hollywood celebrities. Today, personal branding is a key to succeeding in many different parts of life. So, with that said, what is a personal brand? Much like people trust McDonald’s to provide a product that’s cheap and filling, your brand is an attempt to get people to associate you with certain qualities. At its core, your brand is your reputation; how people think of you. Everyone has a brand, but not everyone’s personal brand is developed to be a strength. Think of a celebrity that everyone knows: let’s use LeBron James, one of the most widely known athletes of the modern era. His personal brand for some might be as a dominant athlete and a person known for giving back to his community. For others it might something else, but most people know something about LeBron James. Now, think about someone less notable, say, your friend Steve. Steve might be a pretty good guy, but it takes a while to get to know him. A stranger isn’t going to come to Steve for help, even if Steve is the kind of person who would help a stranger. Basically, Steve’s reputation doesn’t precede him. His personal brand isn’t an asset, but it can be. Big companies understand the importance of brands. Today, in the Age of the Individual, you have to be your own brand. Here’s what it takes to be the CEO of Me, Inc. I was asked by Bill Strawderman (@marketingbard), head of digital marketing at AT&T and Trish Nettleship (@Trishnet), the brains behind the AT&T Networking Exchange blog (now AT&T Business Insights), to address their blogger community on my own Personal Brand journey. While I was honored, my first thought was: what do I know about personal branding? I had never spoken in public about personal branding. I had only been blogging for less than 2 years. But then Bill reminded me that it was my personal brand that allowed me to join his Circle of Trust. It is also how I met the other speakers, the amazing Mark Schaefer (@markwschaefer) and Cheryl Burgess (@CKBurgess). I talked about how I graduated from college into a deep recession and high unemployment that caused a lot of companies to begin to break decades old “contracts” with employees. Layoffs. Downsizing. Rightsizing. It was the era of a CEO called “Chainsaw” and was the beginning of the end of the pension plan. It took me a few years to really understand what Tom was talking about. I joined LinkedIn relatively early. I tried to network in between kids and travel and new jobs. But I didn’t take it as seriously as I knew I should, thanks to Tom. Fast forward to 2019 and the erosion of trust in businesses, government and traditional media. Edelman recently updated their Trust Barometer which shows that the media landscape continue to fragment with the growth of online and social media information. But more importantly, it quantifies the dramatic changes in perceived credibility: trust in CEOs, professional service providers, public servants, and even analysts is down. While trust in regular employees and “people like you” reported huge increases. Only academics and technical experts are seen as more credible and their trust level is flattening. The Time for Brand “You” is Now! Through this content + connections model, your influence grows and you too can become a positive voice in the marketplace, on topics you are passionate about. And you can earn the power to influence a future boss, a future employee, a future customer, a future partner or a future investor in your business. Now I know what you are thinking: “I don’t have the time and I don’t see the value.” But these are the same excuses people use for why they don’t hit the gym or eat better. So stop kidding yourself and start contributing to the social business world. You will help yourself and your business too. We need to simply be ourselves and talk/write about what we know. I believe that if we nurture relationships, then we can become a positive voice in the marketplace, on topics we are passionate about. And we can earn the power to influence a future boss, a future employee, a future customer, a future partner or a future investor in our companies. In my presentation, I cover how “news” is still the best way to reach buyers in B2B Marketing. And I talk about how following these steps and effectively communicating what makes you unique to the world, will bring you personal and professional success. You will gain influence. Your company will benefit from your strong and positive voice. Brands used to be just for businesses. Companies hired consultants and agencies and spent millions of dollars to determine what color their logo was, what fonts really set them apart, what messages covered the key value of their products. But then the internet happened. All kinds of information started moving around the world. Companies and governments and institutions became less important. Social media allowed us to connect with anyone with an internet connection, and later anyone with a smart phone. Part of the reason the importance of personal branding has increased so much in the past decade or so is because suddenly, everyone has access to some degree of information about everyone else. Want to learn about a new doctor who you’ve just made an appointment with? You can see where he or she got their medical degree and what other patients are saying about them with a few taps on the screen of your phone. And now we’re all publishers. And while we have all always had a personal brand, now, this brand is evident on every platform we use to connect with others. Aside from celebrities and athletes, people thought to have a curated personal brand tend to be thought leaders and business consultants â people with professional notoriety. That example shows that this is far from true. Everyone should have a brand. Effective personal branding can open countless doors for you in life. Basically, it would be a mistake to disregard it completely. What Can Personal Branding Do for You? I worked with one company on building the personal brands of 10 consultants. We identified their areas of expertise. We cleaned up their LinkedIn profiles and added examples of their work (videos, articles, recommendations from clients they had worked with). Most importantly, we built a daily, weekly and monthly plan for them that took no more than 2 hours per month: we asked them to share one article relevant to their industry or expertise every day. They spent a few minutes every week connecting with other experts in their industry. And the wrote and published one article every month. The result at the end of 12 months was astonishing: millions of dollars of sales had closed directly from their social network (in this case it was on LinkedIn.) By the second year, the sales deals they were getting via this approach became the largest source of new business for the firm. But this didn’t happen overnight. These people carefully built and developed their personal brand. They became known as experts. They shared the expertise of others. They built the size (and quality!) of their network. And they shared their own expertise. This combination, applied consistently is what delivered the results. This is a relatively new phenomenon: people don’t trust business-level brands or corporate advertising and PR as much as they used to. The market is inundated with brands of products released by companies. A McCann study, as reported by Ad Age, revealed that compared to 20 years ago, nearly half of the people surveyed said that they trust brands less. This, in turn, amplifies the reach of personal brands. Messaging shared by employee accounts reached 561% of the audience that the same messages did when shared by official company accounts, according to Scribd.com. Here are some reasons why you should join the movement of individuals taking more and more care in developing their personal brand. Basically, all of the benefits of personal branding come down to one question: why should someone choose your brand over another? What makes you different and more suitable for the task at hand than your competition? When you want to show someone that they should choose you, you have to brand yourself as a better fit for the role in question. Let’s use sales as an example. B2B salespeople and marketers are often selling more than just a product; they’re selling belief in their personal brand. It’s hard to make your product or service stand out in a market saturated with knowledge. It’s easier when you can get others in a professional community to put their trust in you as an individual. Maybe a review of the definition of a human “brand” would help here. Ries and Trout once said “a brand is simply a perception in the mind of the consumer.” So whether you like it or not, people are perceiving you and your business. Focusing on your personal perception (or brand) will allow you to see what elements of your activity allow you to have higher or lower levels of perception and for which traits. You and your business have different brands because you are perceived as something by those who interact with you. Brands are not logos or colors or PowerPoint templates or website URLs or ad campaigns or slogans. Brands are what your connections perceive you to be. And you have the power to influence that perception! Hiring is done online, but more than that, recruiting is done online. Your personal brand is your digital first impression, like a resume, but more about you personally. The average person spends hours on your resume, fine-tuning and targeting information towards a specific role. Are you putting the same thought into your brand? Take this speaker video from a TEDx event for example: Jane Michael Ekanem, a highly accomplished professional, questions why more women aren’t achieving as highly as men, despite having many of the same qualifications as their male counterparts. What it comes down to, she claims, is that men are often more aware of their personal brand. You can be a perfect fit for a role, but if you can’t get someone interested based on their impression of the brand that you’ve built for yourself, it doesn’t matter. You can’t rely on your resume to open doors for you alone. It’s important to remember that the existence of your personal brand doesn’t start the first time you think about it. Put yourself in the shoes of people searching your name and look at yourself from their point of view: Google yourself! Browse the first few pages and see what comes up. What do the results say to you? If results link to social media profiles, what do those profiles reflect to the people that may be viewing them? I want to be known by business and marketing leaders interested in achieving better results through content that authentically connects with their audiences. While many of us use social media to connect with friends and colleagues, to share our favorite photos and to exchange lots of information, how many of us are actively working to build our personal brands? Should we bother? Won’t our managers wonder why we have the time to tweet and post and +1 when we should be “doing our jobs?” Many marketers are asking themselves if now is the time to build their personal brand. We know that while “brands” used to be only for businesses, we are seeing the start of a new era: the employee-brand. 1. Why is personal branding important for marketers? Because our personal brands and the marketing that we do are inextricably linked. We have to create compelling content and we need to nurture our networks so that we have the personal influence to share great content in an authentic and helpful way. Personal branding is the only way for the marketing of the future to be successful. 2. Should marketers keep separate social profiles for personal and business use? Do you become a different person when you walk into the office or a meeting. Of course not. We are who we are and we need to own it! Our personality is what makes us unique and powerful. The context may be different and we have to respect that a business meeting and family time with our kids are different situations that require different context and norms that must be adhered to. But I like to quote one of my favorite twitter personalities @LisaBarone on this question: Decide who you want to be and then bleed it on all your social accounts. 3. How important is blogging when it comes to your personal brand? Your blog is an opportunity for you to create your own space on the web. Blogging is really important because it allows you to share your unique point of view. It allows you to share content you find valuable. And it allows personal brands like you to become thought leaders. 4. When and why did you start B2B Marketing Insider? I started blogging in May, 2010 because I was asked to drive social media as the head of digital / online marketing for SAP North America. I had always wanted to start one and this was just the push I needed. I also knew that in order to do social, you have to be social. I was already a year into my Twitter addiction and once I started blogging, I really saw how the power of dynamic personal blog content could be amplified by my social connections. I wrote my first blog posts on why I was in Marketing and why I was starting this blog. The key reasons, aside from what I explained above were to claim a stake in my personal brand, to interact with people around common themes, to share my experience and opinions and because I was excited for the journey. I believe blogging is the most important marketing campaign of your life. 5. Any advice for marketers who want to start developing their personal brand? First, is just do it. You have to fight the common myths, aka excuses, people don’t focus on their personal brand: that you don’t have time, that your opinion is not unique, that no one will read it. These are all bull because most people simply have irrational fears that no one will read it or that they will get in trouble or feel stupid. The fact is that we all have unique experiences and opinions and that the world needs to hear your voice. Second, is to simply commit to a regular schedule. I took Seth Godin’s advice to imagine that there is just one person out there who is waiting for your content and to write for them. With that motivation, I get through the days when I really don’t feel like writing. Third, is that blogging is very therapeutic. It helps you to process new information, challenges, frustrations and to take those emotions and turn them into something practical and positive. Last but not least, are the people you meet and the connections you make. I have met and interacted with the most amazing people. And nothing is cooler then when I interact with someone online, we comment on each other’s blogs and re-tweet each other and then we meet in person and have a drink. It’s like seeing an old friend even though you just met. The single biggest factor that keeps me going is all the great people I have met along my own personal branding journey. Define your audience and area of expertise. What do you have unique knowledge about and a point of view? Why are you doing what you do? Define what your brand means. Why you are talking? Who are you talking to? What’s in it for them and you? You have a unique set of experience and passions. Build it every day like a habit. I scan, filter, read, connect, write, respond on social every single day. I share everything that I personally find interesting. Just like email. I believe the adage that social media success is found in just minutes per day. And for me, goals are important. I make every effort to write at least 2 blogs per week. Build real relationships. I try to thank everyone who retweets me. I also share a lot of other content from bloggers I admire. For me, a personal brand is about the people you surround yourself with. Build meaningful relationships with those who you can help and those who can help you. Follow someone new every day. If you can’t find anyone, follow the social networks’ recommendations. Create content on a regular basis. Answer your customers’ questions. Comment on the big trends. Have a consistent voice. Use keywords. Titles matter. Bullets help. Tell stories following the traditional story arc: a Hero, has a quest, goes on a journey, encounters an obstacle and achieves resolution. If you want to get started in producing thought leadership content of your own, I’d advise first getting clear about what you have expertise in and what it is that you love. That’s just a starting point however. It’s really about where you find your passion. Sometimes I write about things I hate, things that annoy me. So it doesn’t have to be all sunshine and rainbows, but it has to come from an honest place. One example is when people talk about content quality versus quantity. It’s so annoying, why do people think you have to choose! You have to do both! The next step is to commit to sharing these views on a regular basis. This can include the things you love, the things you hate, your pet peeves, challenges you see clients facing, etc. And it’s important to share the views and thoughts of others. You don’t know everything. Your audience will appreciate you sharing great content from other people even more than they appreciate your unique point of view. One of the big excuses I get from people who are avoiding thought leadership content is the fear they’re giving away their “secret sauce.” I get this especially from consultants who are worried they’ll be giving away their services for free. This is a baseless fear! No one is paying you for the level of insights you’re giving away in a short article, they’re paying you for the deep attention and results you can produce in their business. I often recommend that my clients write one post a week. Whether that’s on LinkedIn or a personal blog. LinkedIn is great in lieu of, or in addition to a blog because you can gain followers and create connections from there. It usually takes me about an hour a week to write an article, so it’s not a huge time commitment but the results speak for themselves. Let’s return to the scenario where someone else is searching for you online, but this time, imagine they don’t know your name. The only way you can make yourself visible (and thus, more important in your industry) is by ranking in Google for the search terms people actually use. When you write a piece of content, use the keywords people search for, create the content you know they are sharing, and you too can rank for the top keywords in your industry. We spend nearly a quarter of our day in meetings. Half of which we think are meaningless. Execs spend nearly a third of their day in meetings, says the Wall Street Journal. We spend another 25% of our day dealing with meaningless distractions. To me, finding the time for social media is just about making it important. Be social every day. Sounds ridiculous if you think about it in the real world sense. So why not make it “real” online. Make small “investments” in social every day. Tweet once a day. Blog once a week. Do whatever works for you and be realistic. But it’s amazing how persistence pays of when you do this year after year. You’ll have sent hundreds of tweets, created dozens of blog posts, connected with lots of great people and learned more than you would have ever imagined. Share your unique skills and passion. Write about the things you care about, share what interests you, and you will find people with similar interests. Then they will inspire you and encourage you with their own point of view, and interesting that lead to amazing conversations. This in turn becomes the idea factory you need to consistently generate lots of great share-worthy content. Help others. I believe we all have to “pay it forward.” Karma works in the social world. Share the work of people you admire and they will take a second look at your own work. Over time, you will become an authority yourself. Personal branding is good for you, for your business, and for your career. Using these practices to build a positive personal brand for yourself will always have positive consequences in your career and your life. Thanks for the feedback! Glad you like the post.